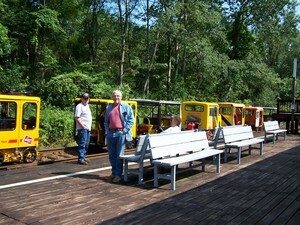 Enjoy the thrill of riding a real motorized railcar. 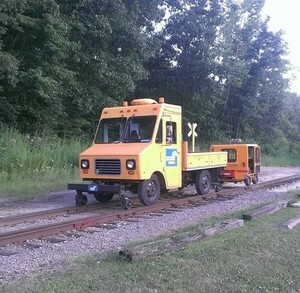 Railcars, or speeders as railroaders named them, are those little yellow or orange boxes with a putt-putt sound that you used to see on the railroad lines during the fifties and sixties. They transported the men and materials needed to repair the railroad tracks before the advent of the "hy-rail" truck. Please note: There will be a regular train ride at 1 pm. Visit our Schedule & Ticket Info Page for more info. Tickets are $35 per person and reservations are required. Call 814-676-1733 or click here to print the reservation form. Leave Perry Street Station and ride to Rynd Farm Station and return, a 27-mile round trip. to pick up your tickets from the ticket counter in the station and to attend the safety course. Perry Street Station will be open by 8 am. This is a fund-raiser for the OC&T. Closed toe shoes required - no flip-flops, sandals or crocs. No one under age 6 permitted.